Schminke water-based ink where the randomness was produced by using dried ink on a large blue inking plate from earlier printing. As this ink was water-based it was possible to achieve a variety of images and effects through selectively re-activated and running the ink using a water spray. These produced effects like those of abstract painter Helen Frankenthaler. Akua water-based inks here I applied Akua ink fresh onto a large plate using a palette knife and trying to reproduce effects like those of Gerhardt Richter. I then further worked into these with Akua liquid pigment. However, although I was able to produce really interesting effects on the plate that when photographed could be the basis for digital illustrations, the ink tended to squash out too much. Apart from a couple of examples my success rate so far is disappointing with these inks. A lot more practice and experience is needed. I also need to try MagMix thickening paste for impasto effects. Something I will try in Assignments 4 and 5 before coming back to this Assignment again. Holbein Duo water-based oils trying to reproduce drip paintings like those of Jackson Pollock. These were also disappointing so far – I need to use thicker paint in a much bigger space in the garden in the summer when the weather is warm. But this was the first time I have tried using water-based oil paints. As I am allergic to solvents and can only use them occasionally I plan to experiment much further with these for Assignment 4 and my studies of Maggie Hambling. Oil-based ink mixes and solvents: these started with some small colour-field experiments trying to get the subtle layering and blending of Mark Rothko and Clyfford Still. But this proved difficult on a small scale. I then worked back into to the ink on the tiles I had used for colour mixing in Project 2.1 using extender and solvents. Although these were only very small studies, they produced some interesting textural effects that I carry forward to Assignment 4. 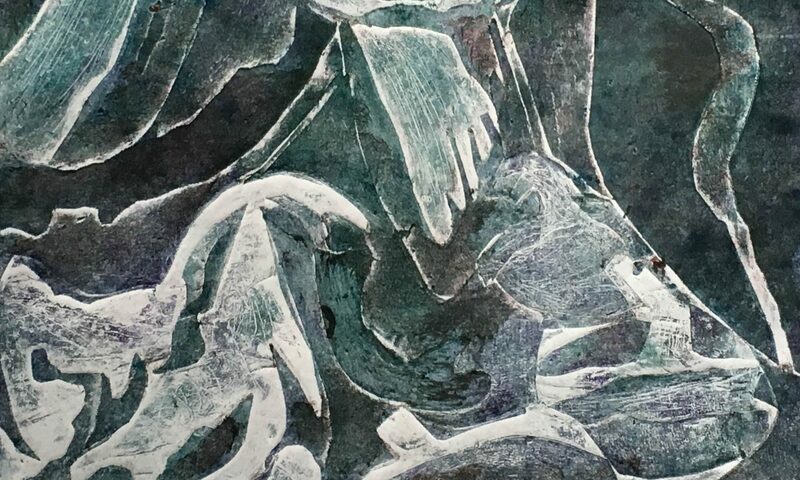 How easy was it to create an entirely random effect which relies on the materials and printmaking process rather than your own conscious planning? I found it easier to produce a random effect when starting with a random process that was not intended for an abstract print eg using old ink on previously-used plates. When I have to start from scratch I already have to make decisions about first marks. These tend to be based unconsciously on landscape ideas with horizons and verticals or caves. I have the sort of brain that automatically sees patterns in random marks. So even if I start with a completely random set of marks, a painting tends to evolve into landscapes, faces or scenes – or be interpreted as such. Once printed, is the effect balanced on the paper? Can you judge it as a composition in the same way that you can a planned, abstract or figurative one? I generally do not find the effect balanced unless I start from scratch and aim at balance. This also requires understanding how the ink marks translate onto paper and that can reduce spontaneity and discovery, particularly using water on water-based inks. But it is generally possible to crop to include the most interesting parts into one or more images that feel ‘balanced’. What makes a balanced composition in a random abstract print? The importance of somewhat unpredictable mark-making in a random print means that textures become an even more important part of the composition, together with shape, colour and line. Because there is no obvious ‘meaning’ the viewer is likely to be more curious about and affected by the composition, colour and texture. But why an image is ‘interesting’ or ‘balanced’ (not necessarily the same thing) becomes much more difficult to explain. Painters like Helen Frankenthaler say they obey no rules. Thick areas of Schminke water-based inks. Make interesting textures and runs with water added, using gravity. Hand printed. Tried back drawing with pencil to get more marks.